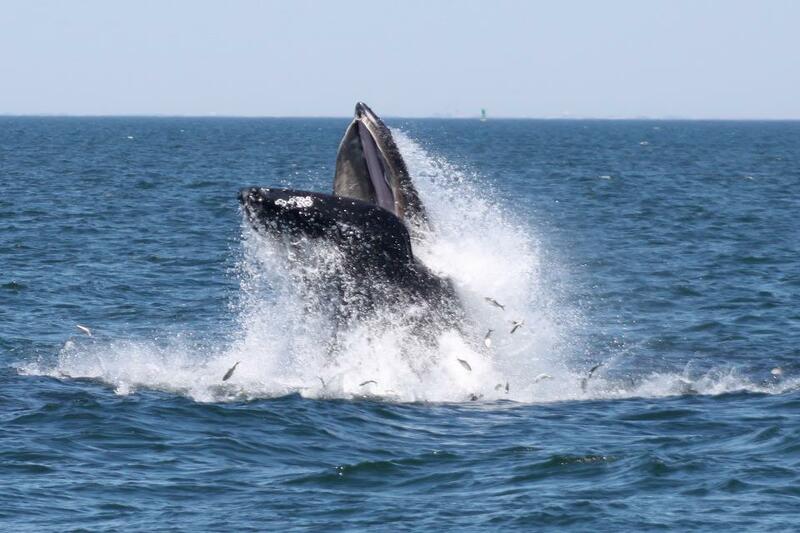 A humpback whale doing a surface lunge to feed on bunker fish near NYC. For as long as I can remember I’ve always been fascinated by aquatic life and the mysteries of the ocean. Early on, that interest was fed with NatGeo specials, Shark Week marathons and trips to the local aquarium. But now that I’m older, and decidedly more adventurous, I’ve begun to look for experiences that allow me to see the animals that I love so much in their natural habitats. I’ve been snorkeling in the Bahamas and the Cayman Islands and have dreams of swimming with whale sharks in the Gulf of Mexico, scuba diving in Australia’s great barrier reef and cage diving with great whites in South Africa. But since I’ll be staying in New York all summer I’ve had to settle for finding marine adventures in my own backyard, which recently I learned can actually be quite exciting. Yesterday, a friend and I went on a whale watching trip for the first time with American Princess Cruises and it was amazing. About 30-45 minutes into the 4 hour long trip we spotted a huge pod of bottlenose dolphins swimming and feeding near a humpback whale. According to one of the women on the boat who had been on one of these trips before, spotting the mammals so quick is rare so we think we had a bit of beginner’s luck. We were on this two story, 95-foot American Princess cruising vessel. We came upon the whale and dolphins so fast in fact that we never actually made it out into the Atlantic Ocean. * Instead we trailed the animals in and around the Romer Shoal Lighthouse which is in Raritan Bay (located between the southern portion of Lower New York Bay between New Jersey and New York). The dolphins were super playful and fun to watch as they jumped in and out of the water and the whale gave us a show by breaching and surface lunge feeding (see above photo) several times throughout the trip. The whole thing was absolutely breathtaking and almost made me tear up. I would absolutely do this again and again and again! The experience is relatively inexpensive. I found a deal on TravelZoo for $25, but the full price is $45 per person (kids under 4 ride free with a paid adult). Cruises leave from Riis Landing in Breezy Point (Rockaway, Queens). You might see humpback whales, finback whales, pilot whales, minke whales, dolphins and marine birds. A naturalist guide will narrate the tour and point out what’s what. 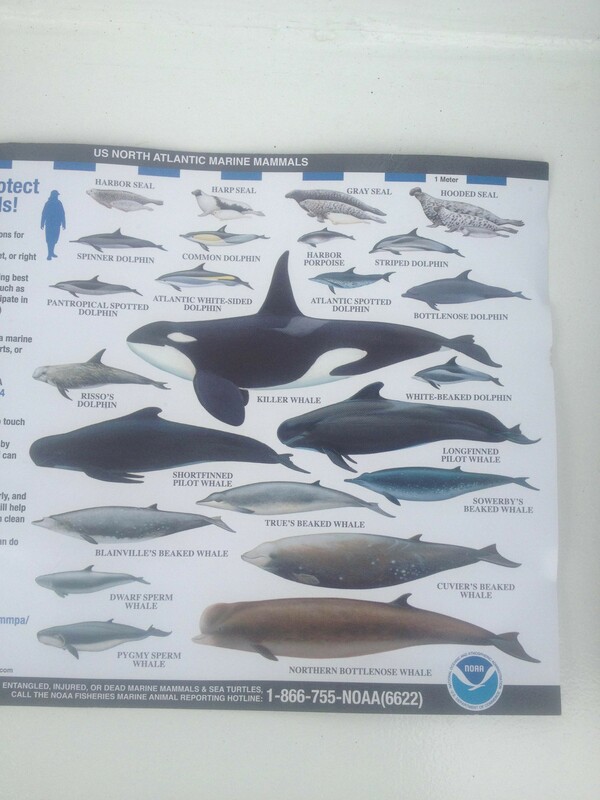 They also give you a 2-sided infographic with marine mammals that frequent the US North Atlantic. The APC whale watching season runs from June 19th – August 29th and boats only leave the dock on Wednesdays, Thursdays and Fridays. There is a cash bar on the boat and they also sell hot dogs and a few other snacks. However, they do allow you to bring food on board. The APC crew is extremely nice and knowledgeable and they were more than happy to answer any questions we had about the cruise (and I had a lot of questions). Infographic showing some of the marine mammals that frequent the US North Atlantic. Wear comfortable shoes (preferably sneakers or closed-toe shoes). I had on sandals and am super clumsy so I tripped a few times. Bring a windbreaker or sweater just in case. It’s always somewhat chilly on the water and it drizzled a little bit during our trip so having a jacket definitely came in handy. It was really hard to take photos of the whale when it came out of the water so it’s best to bring a video camera and have it on record the entire time. Bring a back-up battery because you’ll need it. Bring a bag lunch and cash for the bar. If you’re running late, DO call APC and let them know. We were stuck in slow-moving Queens traffic and thought we were going to miss the boat. But we called and they said they would wait at least 10 minutes for us at the dock. And they did, which we appreciated because they only do one trip a day so we would have had to come back. Plan for crazy traffic and give yourself enough time to make it to the dock on time. 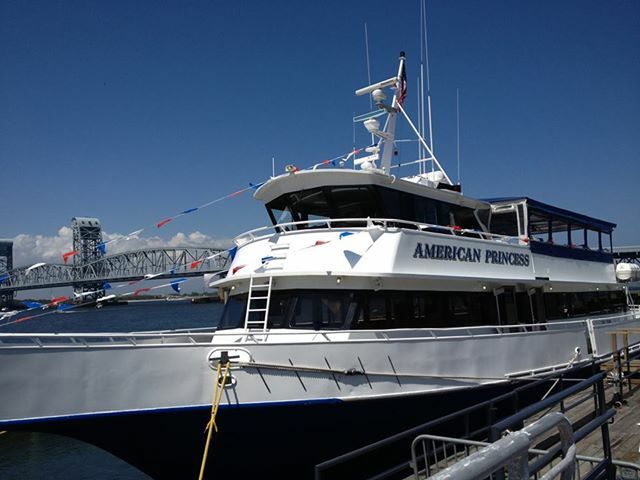 To learn more about American Princess Cruises check out their Facebook page or visit their website. *I didn’t find out that we weren’t in the Atlantic until I spoke with the Captain after the trip. He said that sometimes they have to go as far as 20 (nautical) miles off shore before they spot any of the animals. We got lucky.